This is a recipe I have been playing with for years and I finalised it recently whilst delivering the Love Food Hate Waste campaign in Roath. I was looking for recipes in my notebook that can help people use their leftovers and what they have in the fridge/freezer. The savoury cake was one our roadshow freebies and was sampled at our last Love Food Haste Waste event on 10 Mach at Cardiff Students’ Union in return for pledges to take action to reduce waste. It is a delicious recipe that can be adapted to help you use greens and smaller quantities of leftover vegetable. The batter can remain the same and you can be as creative and daring as you like with what flavours you create. You end up with an amazing tasty snack on its own or with some relish or chutney on top and a (gluten-free) substitute to bread which is fantastic with soups or a tin of baked beans. Cornmeal is a basic ingredient for one of my favourite Greek breads called Bobota. Grated pumpkin and marrow with cornmeal and feta cheese has always been one of my most favourite bakes that my southern Greek Granma Vasiliki used to make for us. And five years ago the lovely Zoe English, of Bird to Market, handed over Nenneh Cherry’s cornbread recipe to me after my excited squeals on tasting it for the first time in my life. So this savoury cake recipe is born from all these influences and is fast becoming one my favourite things to make this spring. I have adapted it to be gluten free – through the use of gluten free plain flour. 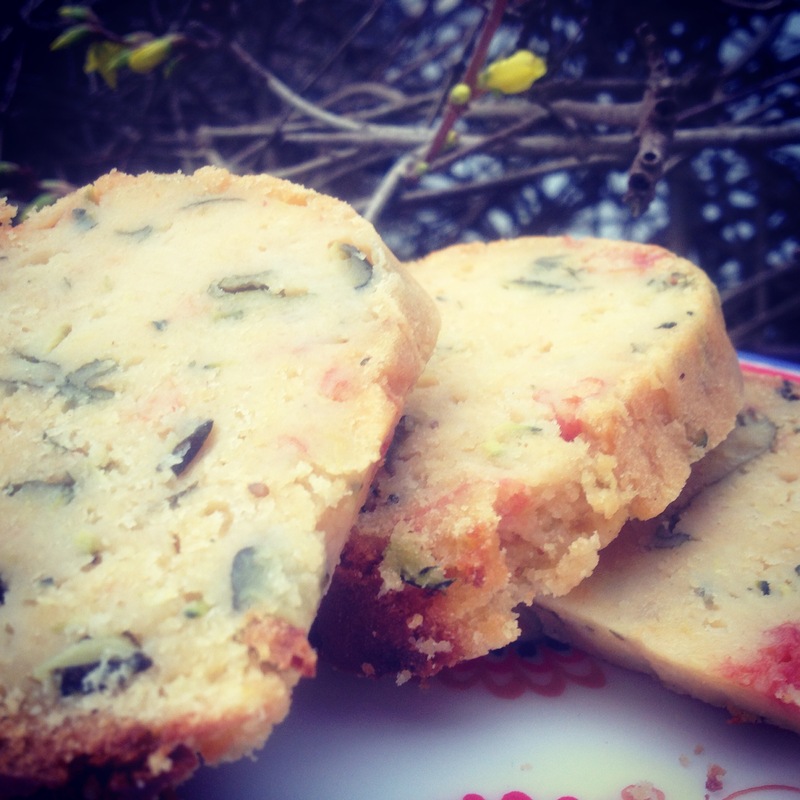 And with courgette and tomato season approaching and rainbow chard already on the tables at our Farmers’ markets I am very excited for the many versions of the savoury cakes you could be imagining. Enjoy! Prepare your vegetable mixture first to allow enough time to cool. Fry the sliced onion with a pinch of salt, cover and let to nearly caramelise whilst you prepare the rest. Dice the courgettes or aubergine and halve the cherry or plum tomatoes. Add the courgette or aubergine with another pinch of salt and fry for 5 minutes. Add the tomatoes and basil, stir and cover until all ingredients soften- for around 5 minutes. Taste and season with salt and pepper if needed. Remove from heat to cool down. Grate the last courgette and the cheese. Mix the flour, cornmeal and baking powder. Add the rest of the dough ingredients and mix well so that there are no lumps. Add your fried ingredients, raw courgette and cheese. Pour into a lined baking tin and bake on 180 Celsius for 40-50 minutes or until a skewer comes out clean. The batter should be moist but not too runny. You can add 450ml of the milk first and see if you need to add more after you add the tomatoes and vegetable. You can use spinach and other greens such as Kale. Feel free to experiment with various herbs ad ingredients. Use what you have in the fridge and for inspiration on flavours look up focaccia recipes. This is a great recipe for using those herbs that you have in the freezer or the ones that are about to go off in the fridge! For a bread tin and smaller quantity of the cake halve the recipe ingredient. The cake rises quite a lot and it keeps well in the fridge for about a week. This entry was posted in Recipes, Vegetarian and tagged Cardiff, cooking workshop, cornmeal recipes, gluten free, LFHW 10 cities campaign, LFHW ten cities campaign, LFHW UK, Lias Kitchen, love food hate waste wales, lovefoodhatewaste, savoury cakes, Wales. I can truly say – hand on heart- it really is. Let me know what you think if you make it.